The French Department of Guadeloupe was an archipelago of nine inhabited islands, including Basse-Terre, Grande-Terre, Marie-Galante, La Desirade, Iles des Saintes (2), Saint-Barthelemy, Iles de la Petite Terre, and Saint-Martin (French part of the island of Saint Marti. The further islands of St. Barthelemy and St, Martin have since pulled out and now "Guadeloupe" refers to the largest of these islands. It is traditionally described as "butterfly" shaped consisting of Basse Terre and Grande-Terre. 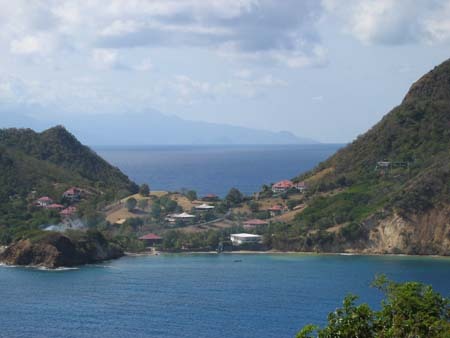 If you are not confused enough already, Basse Terre is the high, mountainous land on the left (eastern) wing of the butterfly and Grande Terre is the low, flat land on the right wing of the butterfly. Perhaps this is not confusing if you don't speak French. Guadaloupe is large by Caribbean standards with a population approaching 1/2 million. We usually pass on the lee side and spend time in Deshaies, the traditional cruiser hang out on the north west. Another nice stop is Pigeon Island for its marine park. We have passed on the windward side going north to Antigua and we have passed through the narrow waist in the Rivière Salée. They have since stopped lifting the bridges over the passage and it can no longer be used by sailboats for transit. The Saintes are not to be missed for the charming land, the good food and the fabulously clear waters.